I first met Ian in 1959, during my final year as an undergraduate. What a strange year that was! I was not to realise it fully at the time, but it was the year of Lowell’s Life Studies, the greatest influence on Ian’s view of poetry and a significant historical watershed in many ways. In the parochial world of student poetry things were different. In the aftermath of the visit of Allen Ginsberg and Gregory Corso in the previous year, a disastrous wave of drugged and lower-case formlessness had afflicted Oxford poets fascinated by the Beat Generation’s typescripts (drawn tantalisingly one by one from Ginsberg’s travelling basket at readings). Already the university seemed to be tiring of the intellectualisms first introduced by MacBeth and Thwaite and somewhat perpetuated by Lonsdale and Spink. The work of my friends Dom Moraes and Peter Levi had a decidedly neo-romantic flavour. At the time, as a recent semi-surrealist, I had been fascinated myself by the ‘great eye sounds’ of Corso, and even quite proud to print his work along with that of Ginsberg, Kerouac and Burroughs (probably for the first time in this country) in Isis. But the general trend (soon to be reflected in the wilder productions of Cape Goliard or Trigram) wasn’t at all to my taste. For that reason, Ian’s magazine Tomorrow, launched in the summer of 1959 with lashings of Michael Horovitz and thin jests from the 21-year-old Roger McGough, certainly passed me by at first. As a poet I wasn’t much interested in the idea of ‘tomorrow’, and as a student facing finals I was too compulsively caught up in the past. It wasn’t until I encountered Ian in person, and experienced his demanding, dismissive, uncompromising sensibility at first hand that I realised that he didn’t much like what he had been printing either. But a hungry man must eat something, and he was simply setting up his shop, and the shop-front was provided, impressively, by Oscar Mellor’s absolutely authentic Fantasy Press. I very soon arrived at a complete awe for the blue-chip value of Ian’s commitment to little magazines. Tomorrow did matter, after all, and a poetry magazine wasn’t just the glamour of history, Pound as procurer of modernism, etc, etc. It was a social instrument, a personal crusade. And poetry was, yes, as important as football. Ian was different from most Oxford poets: tough, austere, unprivi1eged, unpretentious. He possessed a natural tight-lipped authority that paid no dues to the established channels of influence. I liked him immediately, and felt a strange surge of relief and literary homecoming of some kind when he took me on board. He induced me to review Donald Davie’s The Forests of Lithuania for Tomorrow no. 3, and allowed my friend Francis Hope to do a hatchet job on Geoffrey Hill’s first book. I think we both wanted to please, wanted to claim a place in a forum for which Ian’s charisma seemed to guarantee a future. No matter that it was such a mixed bag. It would get better, we knew. And it did. The vastly expanded no. 4 contained, among other goodies, the first printing of Pinter’s A Slight Ache. I knew that I had found a significant ally whose ambitions cast into the shade my earlier editorial flirtations (Isis; Gemini; Oxford Poetry; Universities Poetry -- all in various ways circumscribed by local circumstances or the deadness of committees and their alien assumptions). I carried the poetry magazine virus in my blood, but I had never let it rage untreated. Ian was seriously infected, and I admired his single-minded genius. But Ian was almost as unsatisfied with Tomorrow as he was with the magazine he had edited at school in Darlington (the contents of the latter ostentatiously consisting, as he ruefully confessed, of irritated letters from famous writers refusing to contribute). He had managed to ditch his co-editor on Tomorrow, but in the face of the financial difficulties which were for ever afterwards to haunt his editorial chair he wanted a new start. Valuable boxes of back-numbers were abandoned in a porter’s store-room in Keble College because Ian, with a large battels bill unpaid, dared not risk being seen claiming them. As we discussed possibilities during 1961 it became clear to me that Ian was a compulsive serial editor. It was rather like his smoking. As our evenings wore on, Ian would become paler and more terse, his disagreements bleaker, his enthusiasms less vocal, his face drained -- until he simply had to leave (wherever he was, whatever the hour) to find a cigarette machine. Without a magazine, he similarly became edgy anxious, unfulfilled. The only relief was fiercely competitive bar-billiards, or darts, accompanied by the yeasty cloudy bottled Worthington that we liked to drink. After marriage and graduation in 1960 I had to concentrate on my research, more exams, and eventually the negotiation of a job in the US. But I eked out my grant with reviewing, and could therefore commiserate with Ian who endured the constant slavery and distraction of WEA classes to keep the wolf from the door. Reviewing is flattering to the reviewer, who will feel that an important part of life is not merely writing poetry but telling other people, whether they like it or not, how it should be written. It is, of course, really a way of learning the same thing oneself. This is why little magazines should only be edited by the young. Thus in a short time (certainly by December 1961) it merely became a matter of what this new bi-monthly magazine was to be called and where the money was coming from. From my Bodleian desk, working on the early 18th century, Defoe’s The Review sounded a retrievable title. It was severe enough, in one sense, but also relaxed and neither starry-eyed like Tomorrow nor forensic-academic like Evidence in Writing. It was going to be responsible and investigative, and also open-minded. The open-mindedness was always a little surprising to me, who knew very well the range of Ian’s scorn. I never understood why, for example, he printed my long light poem in tetrameter couplets, ‘The Art of Love’ (‘I loathe leisured, “witty”, knowing poetry,’ he had told me. ‘I loathe that which is assured because it has so little to be in doubt about, I don’t much care for light, satiric verse’), but I suppose it was for more or less the same reason as he went ahead later with an issue of Black Mountain poets (‘I half agree with all you say about the Black Mt. people…but I think that in terms of information the number is a useful one’). The fresh air, therefore, was the sort that you get from your own mountain, ie. a view of everything else. Those early years, with a fair amount of the magazine written by ourselves under pseudonyms and every subscription worth the celebratory drink which made a large hole in it, with darts or football (Beechcroft Road version) and with evenings of smoke-clouded conspiracy, were years for me never to be matched for excitement and sense of collective intent. Ian and I have both had other lives since, but our exchanges at that time were a critical benchmark of sorts for me, part of growing up. There are not many people who will tell you when your work ‘won’t do’ and I am grateful to Ian for never disguising that truth. How easy it might have been to have lived within a world of ingratiation and false esteem! I am sure that all Ian’s friends will agree that we who have been lucky to have known him have escaped such a fate. We have seen our dud manuscripts on his knee, whether in actuality or imagination, and we have been better for it (I refer to his poem ‘Critique’). Even now, whenever I encounter some literary fatuity especially one committed by myself, I feel the better for remembering his laugh of disbelieving wonder: the shoulders resigned, the brows raised, the mouth under severe control, the eyes narrowed and dancing, the cough, the air around him full of smoke. Race you to the sea, Ian! 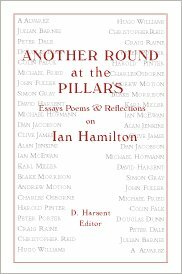 ** Originally published in Another Round at the Pillars: Essays, Poems, & Reflections on Ian Hamilton. Edited by David Harsent. Cornwall: Cargo Press, 1998. 120-24. Reprinted with permission of the author.